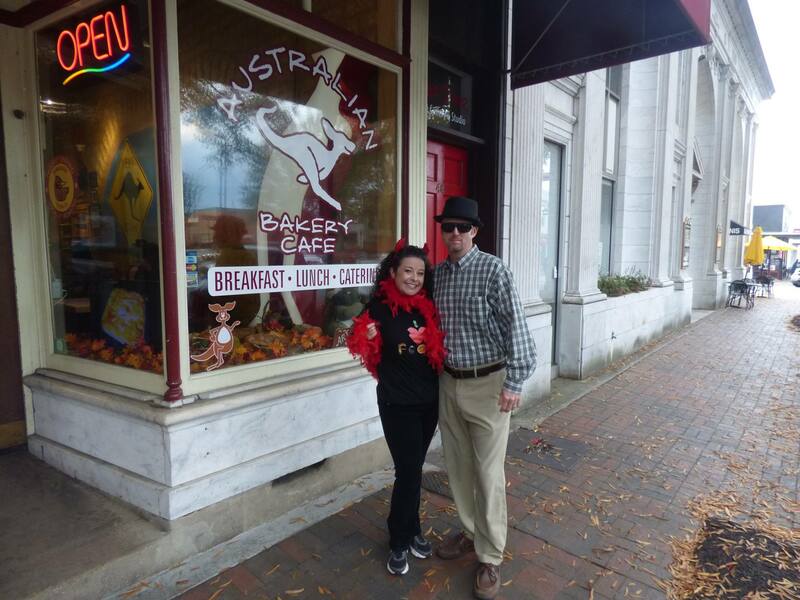 Cecilie dressed as a Devil’s Food Tour Guide and Brian as Walter White. Photo courtesy Marietta Food Tours. This past Saturday I had the pleasure of learning first hand why Marietta Food Tours is raking in rave reviews on Trip Advisor. Founders Brian and Cecilie Benefield started the business in 2014 and guide the tours personally, offering a great deal of background knowledge on the history of Marietta Square, local businesses, and the backstories of the chefs providing tasty concoctions at the seven stops. They are exceptionally personable and dedicated to the success of local businesses. Since our tour was taking place at the same time as Trick or Treat on the Square, they were even dressed in costume and handing out candy to the dozens of costumed kids. My advice? Go hungry. Many of the portions are quite generous and I had stupidly wasted space with my morning oatmeal, not that I let that stop me. 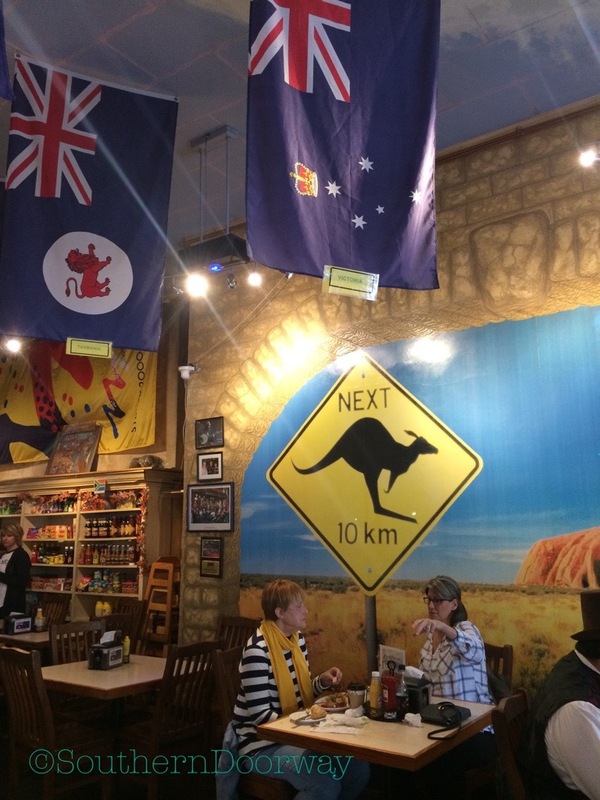 The first stop was the Australian Bakery Cafe. Here we sampled an off-menu item– an orange roughy, authentic Australian-recipe fish and chips. Oh, the flaky crust was to die for. Three Australians run the cafe in a space that used to be an ice cream/candy shop and is believed to be the first place to have served Coca Cola on the Square in the 1920s. The Australian meat pies they bake and ship all over the country are so popular that they sold 250,000 last year. I will be back for you, meat pies. That’s a promise. Next was WR Social House, recently rebranded from its time as Willie Rae’s under the previous owner. Butcher Micah and Baker Katie Pfister own it and next door’s aptly named farm-to-table restaurant The Butcher, The Baker. There we sampled a pimiento cheese fritter, topped with local honey and homemade hot sauce. Just the words “pimiento cheese” make me giddy. I will return to try their goat cheese stuffed fried green tomatoes. Paul’s Pot Pies was the third stop. He has been a presence on the Square for thirty years and my husband and I are already huge fans. 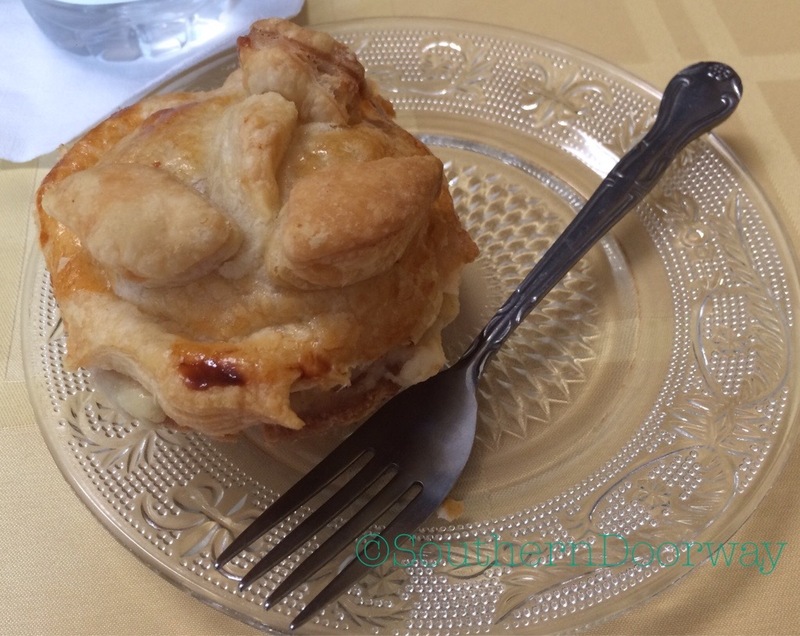 His classic chicken pot pie was featured on the Travel Channel, but for all his pot pies I have consumed, the tour was my first time eating that particular version. Though he sells six and 10-inch pies, he bakes three-inch individual pies for tour members, topped with his signature dough flower. He tries out new pot pies from time to time, and gauges customer reception to decide what stays and what goes. My personal favorite is the jambalaya, followed by the chicken curry. My husband’s favorite is the Italian sausage. I wrote about stop number four, Cool Beans Coffee Roasters, previously here. I love coffee. I love it so much. We sampled one of their locally roasted brews and I was a happy girl. 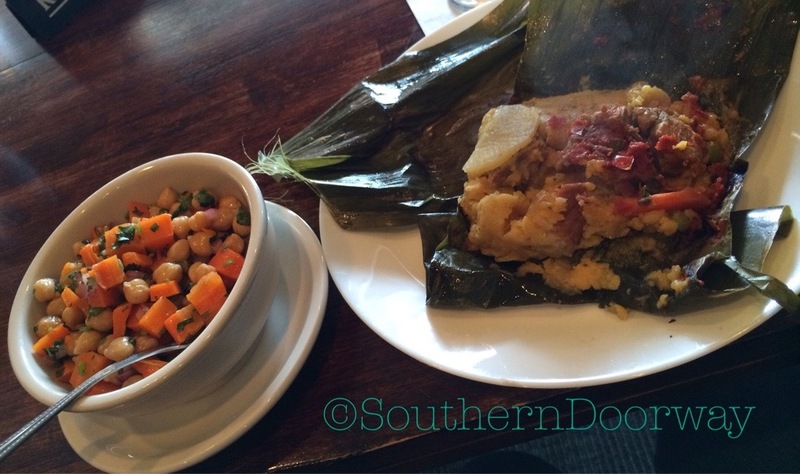 Now hopped up on caffeine, we headed to Kiosco Colombian Restaurant. I recently tried Kiosco for the first time on my birthday earlier in October (post coming soon). My friend of more than 20 years, who hails from Cali, Colombia, put it on my radar several months ago. On the tour we sampled the amazing and delicious tamale, and I resisted the urge to steal my neighbor’s serving. Cecilie and Brian wisely left the Marietta Wine Market towards the end. I assume this cuts down on guests, such as myself, from disappearing never to be seen again. The Wine Market boasts the largest selection of Georgia wines in the state as well as wines from all over the world. 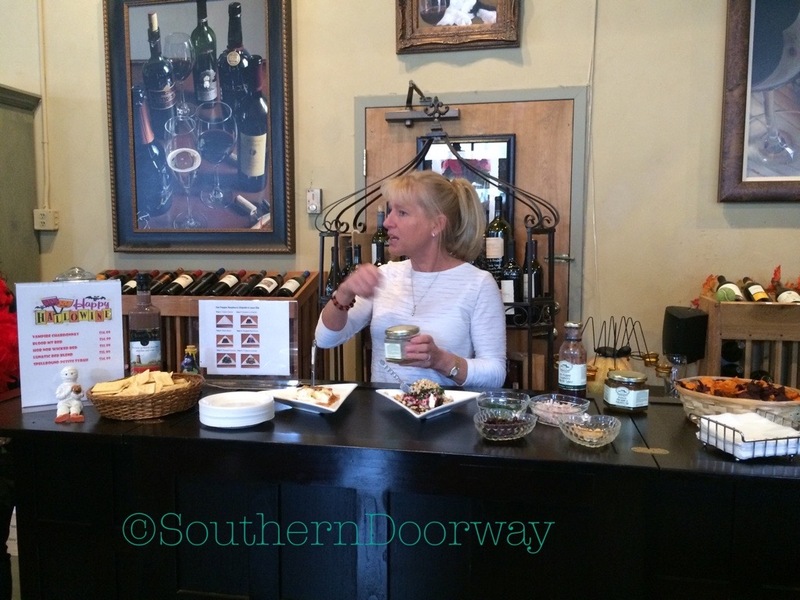 We were greeted by Bentley the doordog, and co-owner Karen Heard demonstrated a couple quick and easy appetizers using their gourmet food products. Being Halloween, she departed from traditional wine to have us sample Choco Wine, or as she called it, Yoo-hoo for Grownups. I can’t tell you how many times I’ve picked up a bottle of chocolate wine and chickened out, not confident it wouldn’t be disgusting, But I finally settled my curiosity. Delicious. Same goes for the roasted pineapple and habanero dip. The tour wrapped up with dessert at Miss Mamie’s Cupcakes. 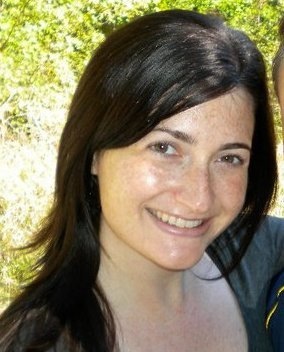 Mamie won a competition on a 2012 episode of the Food Network’s Cupcake Wars. The episode was broadcast in the Square and so many people showed up to watch, some had to be turned away. The following year she sold 90,000 cupcakes. 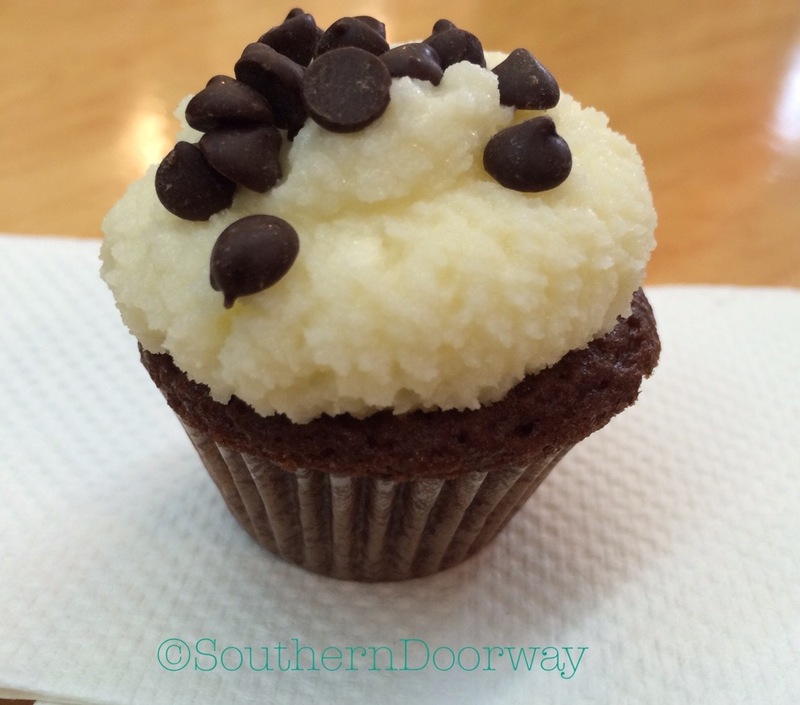 We sampled the chocolate Guinness cupcake topped with cream cheese frosting. Seven stops in three hours and not one thing I didn’t like. Brian and Cecilie even do their best to accommodate people with eating restrictions, as the two vegetarians on my tour were able to sample alternative dishes when a meat dish was provided. Besides getting to stuff my face, I also had a chance to really take in much of the change at Marietta Square that has taken place in the last few years. As costumed children pulled their parents from store to store, a choir sang on the Square’s stage and the weekly farmers’ market wound down the last hour, I really got that small town feel, though we are but a stone’s throw from Atlanta. The culinary game is on fire. I’ve lost count of the number of recent festivals I’ve attended there. And besides the stops above, I discovered even more places I can’t wait try, even though we just briefly spoke about them as we passed. I’ve added the French-owned-and-operated Le Cafe Crepe and southern fare Double Take Cafe to my list. We also made a brief stop in front of Tiny Bubbles Tea Bar, which I previously blogged about here. At the beginning of the tour, Cecilie and Brian stated that one of their goals is to make you feel like a Marietta Square insider, whether you live here (as I do) or are visiting. I can definitely say that I walked away with that feeling. 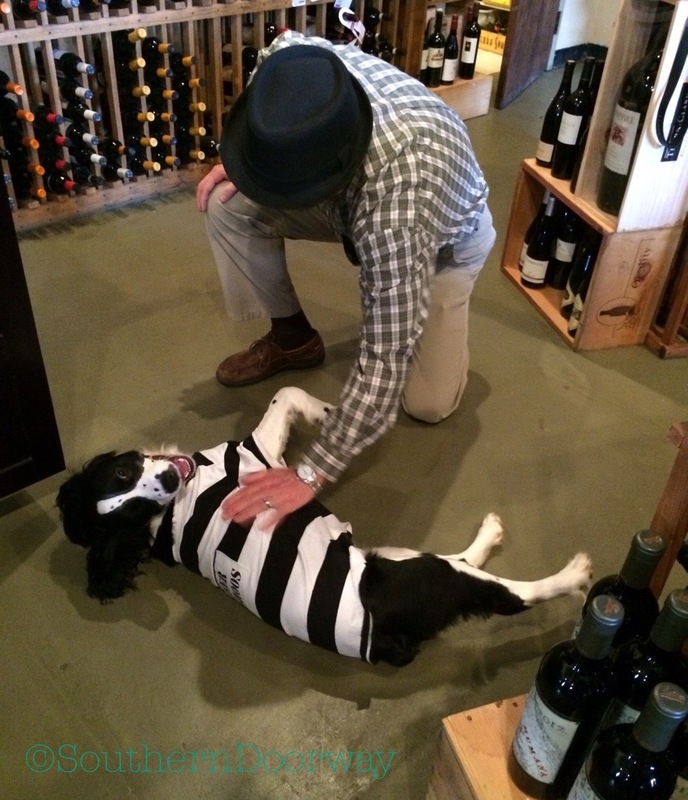 Brian with Bentley the doordog of the Marietta Wine Market. Book your tour here. They take place on Saturdays at 11.